Video and Broadcasting industry is growing at a fast rate. Every week, there are enhancements available over the existing technology. Right from the picture quality to broadcasting the programs as good as Live, the industry is showing its determination to achieve close-to-real experience. Thus, to make the front end as beautiful and sumptuous as possible, a series of improvements are done by the makers, such as Cozlink,in the medium through which signals finally reach the receiver. Video SFP transceiver is one such enhancement approved by SMPTE standards, and is responsible for the HD video experience that any AV medium is known to deliver. What are Video SFP Transceivers? The SFP video transceivers do the job of transmitting HD-SDI, SDI or DVB video signal through fiber medium with the help of standard optical transceivers. This dual channel optical module transmits optical serial digital signals as per the standards entails in SMPTE 297-2006. The Video SFP transceivers can deliver data transfer speed range of 50Mbps to 3Gbps. Its specialty lies in transmitting SMPTE 424M/292M/29M/259M pathological patterns video on a single mode fiber spanning over a distance of 10, 20 and 40km. The Video SFP transceivers of digital nature allow the transmission of SDI, HD-SDI, or DVB ASI component video signals over the MSA approved optical transceivers that are integrated into an optical transport system. 3G-SDI/HD-SDI Video SFP transceiver: It is a highly sensitive, feature-enriched video optical SFP transceiver that reaches -23dB at 3G-SDI using a pathological impetus. This transceiver is available in various I/O configurations with superior jitter management feature. It complies with industrial standards such as ST-424, ST-292, ST-259, ST-296. 3G-SDI BiDi Video SFP transceivers: This transceiver type supports video pathological patterns for SD-SDI, HD-SDI and 3G-SDI. It features 1310nm DFB laser and PIN photo detector. The Tx/Rx combinations supported by these transceivers are 1310nm/1550nm, 1550nm/1310nm, and can deliver data up to a distance of 20km, 40km on single mode fiber. 3G-SDI CWDM Video SFP transceivers: 3G-SDI CWDM optical transceiver modules are high performance, cost-effective connectivity solutions ideal for long reach video transmission. These are designed to deliver 50Mbps to 2.97Gbpsof data speed for SMPTE 259M, SMPTE 344M, SMPTE 292M and SMPTE 424M serial rates supporting SDI pathological patterns. Since it is functional at all 18 CWDM channels ranging between 1271 and 1611nm, it allows the user to increase the bandwidth limit of existing optical infrastructure enabling video functions without incorporating additional fiber strands. Other methods of classification are – whether compliant to MSA or not, on the basis of transmission mode – single Tx, single Rx, dual Tx, dual Rx and TR transceivers; and on the basis of input wavelengths – 1310nm, 1490nm, 1550nm and CWDM transceivers. The 3G/HD/SD-SDI is a reconfigurable Video SFP Transceiver in combination with an amplifier delivers a card-based solution for achieving high-density conversions between coaxial SDI/ASI, fiber, HDMI, etc. The card has an SFP slot at the rear and so all the connections can be enabled externally without disturbing the cabling infrastructure. 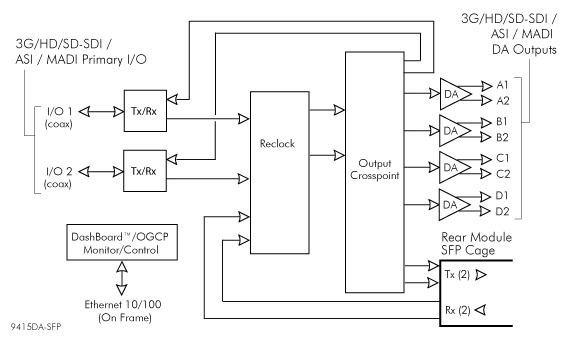 A cross-connection point on the card accepts numerous inputs to deliver coaxial DA outputs in addition to 1-2 Rx and Tx paths through the external SFP slots. In a single frame, up to 20 cards can be installed to get 40 conversion channels when a high density split type rear SFP module is used. The SFP module can be a non-MSA type but works best when MSA compliant. The single and dual-channel Tx and Rx modules can support a wide range of electrical or coaxial as well as fiber conversions. The card allows input EQ up to 110m 3G, 180m HD, and 360m SD cable length (1694A). Pathological patterns, also known as SDI are a whole test signal worth carrying out during blackout. It is an important performance indicator of video SFP modules and is considered difficult to handle by a serial digital system. It provides significant help in assessing the system performance. Structurally speaking, a pathological pattern contains the signal-rich but low-frequency energy that numbers one per frame. The pathological patterns SFPs are available in both single-mode and multi-mode types. The 3G video SFP transceivers are applicable in connections that are helpful in transmitting optical digital signals at serial rates of SMPTE 259M, SMPTE 344M, SMPTE 292M and SMPTE 424M as explained in SMPTE 297-2006. When you require digital optical signals to reach a distance of 40km with transfer speed ranging between 50Mbps to 3Gbps, pathological pattern SFPs fit the bill perfectly. These high performance video SFP transceivers are also applied in HD camera or monitor system, digital video routers and switches, 3G-SDI/HD-SDI/SD-SDI electrical to optical converter and also in 3G-SDI/HD-SDI/SD-SDI optical to electrical converter. SFP video transceivers of optical nature are time-relevant connectivity solutions because of the high demand of HD and UHD monitors. 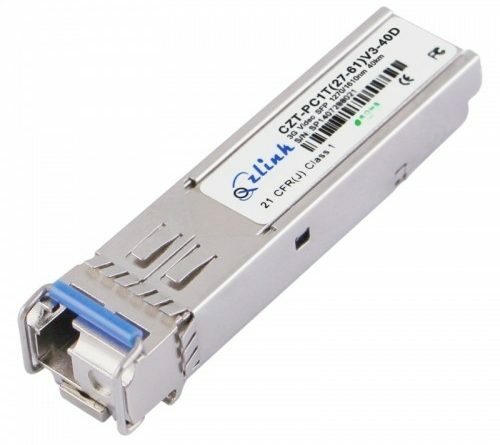 Optical video SFP transceivers are MSA and SMTE compliant and are fully supportive of the existing cabling infrastructure and connector slots. To know all about the SFP video transceivers and ordering information, you can visit www.cozlink.com.